Threw for 3 hours this morning trying to catch baits . A major front moved through last night and repositioned the bait and the fish. We started out runing flats but had no luck and kept seeing the fish stacked over the channels so we put out downlines in addition to runing boards and ran depths from 30 ' down to 5 ' and still could not score. 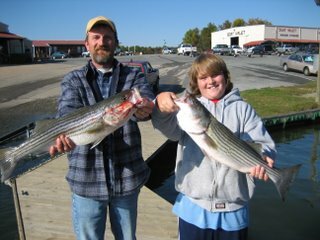 We fished 3 different areas and Chance finally caught a Striper over 23' of water on a board. Fished for a couple more hours and Herb caught one just at the end of the day. We fished hard all day and at times had 14 lines out for only 2 strikes. Although fishing was tough today the guys stayed optimistic and had a good time. this is chance from the picture and i had a awesome time reeling in my 5lb 6oz striper. it took me 30min to get it in.that was the biggest fish i caught out of lake anna.